This is a guest post by Kathy Hemsworth. Saving money is the name of the game. More and more people are watching their spending habits and working to save money. 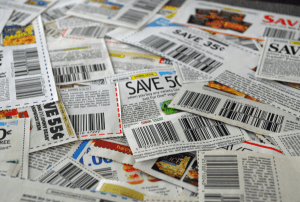 Buying more items when they are on sale, and even using coupons to increase your savings is a smart move when it comes to making all kinds of purchases. There are techniques you can incorporate that will help you maximize your savings, so take the time to look over the sales ad and do some planning. Sometimes it is easy to get carried away when you find a good deal. Don’t buy in excess. If it is a product that you will use often or in larger amounts, such as laundry detergent, paper towels, toilet paper or shampoo, it may be beneficial to buy larger amounts. However, if it is a food product that will expire before you get around to consuming it, buying extra at a sale is not benefiting you at all. Therefore, buy in quantities that you will realistically use before the product expiration date, if applicable. Remember, part of saving money while maximizing the benefits of a sale is not buying everything you want. By planning ahead and by making the right choices, you can find out that taking advantage of extreme sales can keep some cash in your pocket and help build your savings account. Buying the cheapest product is not always the best move. Give consideration to the product quality. As an example, consider buying socks. You could buy socks for $1 per pair at a discount store. However, these socks are not high quality and last about a month. You come across a sale where name brand, high quality socks are available at a discounted price of $5 per pair rather than the regular price of $8 per pair. These high quality socks last a year or longer. In this case, you are saving significantly by purchasing the higher quality socks at the sale price. This leads us to the first tip about taking quality into consideration. Consider the quality. Poor quality does not help you save money and could actually cost you more. Look over the sales ad and check off the items that you want to buy, so you won’t be tempted to waste money on things that you don’t need or don’t use as often. Go to the sale knowing what you plan to purchase. Don’t overbuy. As previously explained, don’t buy more than you need. When possible, use coupons to maximize the savings. Coupons used in conjunction with sales prices can make the financial benefits even more significant. Don’t drive long distances for just a few dollars in savings. Consider the travel cost and the overall savings before deciding to venture farther away from home. By just paying attention, you can maximize the savings you get from extreme sales. 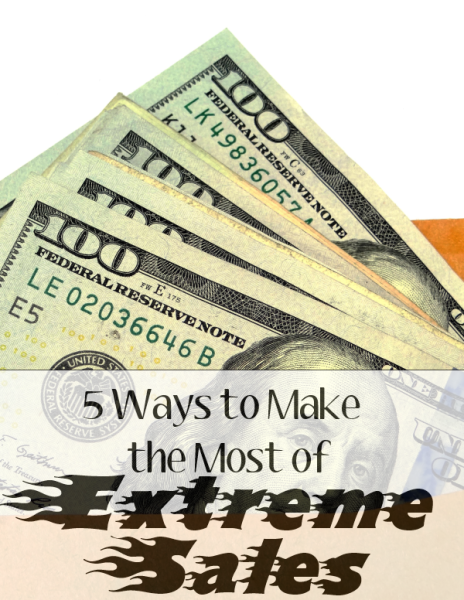 And, by watching for extreme sales, you can save yourself a significant amount of cash throughout the year. Now, head out and take advantage of extreme sales and get yourself some extreme savings. About the author: Kathy Hemsworth has 25 years of experience as a professional writer and editor. During that time, she has written extensively about financial topics, including those that emphasize saving money. You can learn more about improving your savings and budgeting at this link.